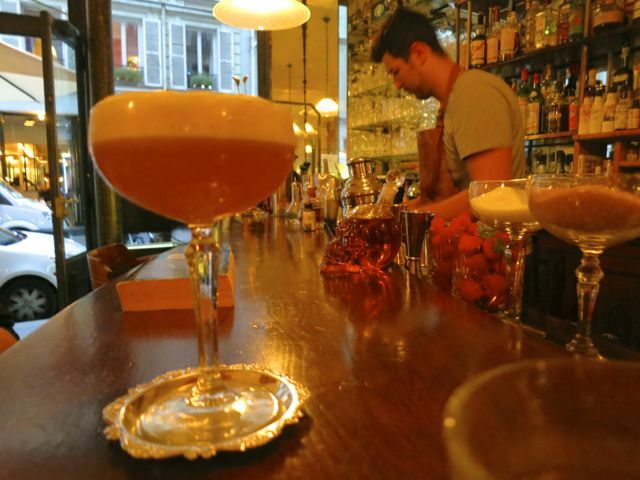 The streets around Bastille are bursting with bars serving cheap drinks that pull in a young, lively crowd. And while there is no shortage of options, there aren’t many that manage to stand out from the crowd. However, I stopped in at the Café Moderne with Caroline recently, and found they’re well on their way. While the majority of this bright and busy establishment is taken up by diners, thirsty clients can pull up a stool at the long wooden bar. Red walls add some warmth and the black and white tiles bring some class to the front room, which feels a bit more art deco in style. In the back area, light walls, exposed brick, and quirky signage lend a NYC vibe. 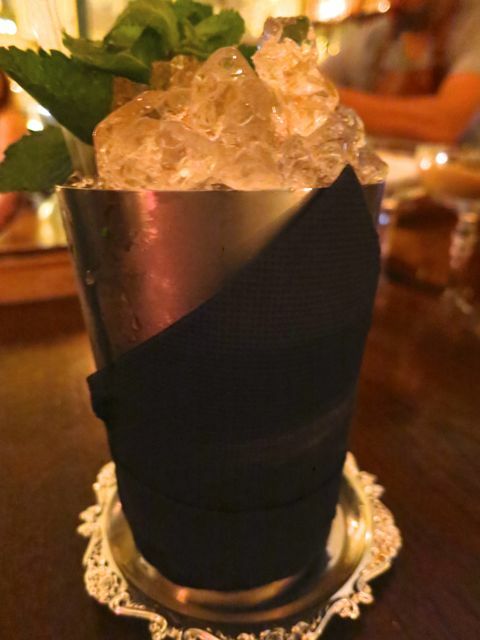 While the drinks menu might be more accessible than what you’ll find in other dedicated cocktail bars, Mido has the skills to create a classic or go in a different direction for those who want something beyond the basic offerings. And, he seems to have made an impact on the neighboring establishments. While we were there, another bartender came in, cocktail in hand, which he passed to Mido for a taste test and, apparently, some advice. After a brief discussion and a suggestion to amp up the citrus, he left, presumably to continue working on his own cocktail creations at whichever bar he came from. As I come to know more and more of the city’s bar staff through industry events and generally getting about town, I must admit that it becomes increasingly difficult to judge service from the perspective of an unknown customer. Mido has always struck me as a friendly, curious and enthusiastic barman; qualities that should serve him well in his profession. And, because of my profession, I hear a lot of complaints from consumers about various places. In fact, I’ve been hearing quite a few complaints recently about a relatively new spot, which I will resist calling out for the moment in hopes that it’s just learning how to deal with quick popularity. But, that is why I’m specifically happy to report that Mido is one barman about whom I’ve heard some rather nice things from other visitors to the bar. So I’ll assume he treats all of his customers equally well. 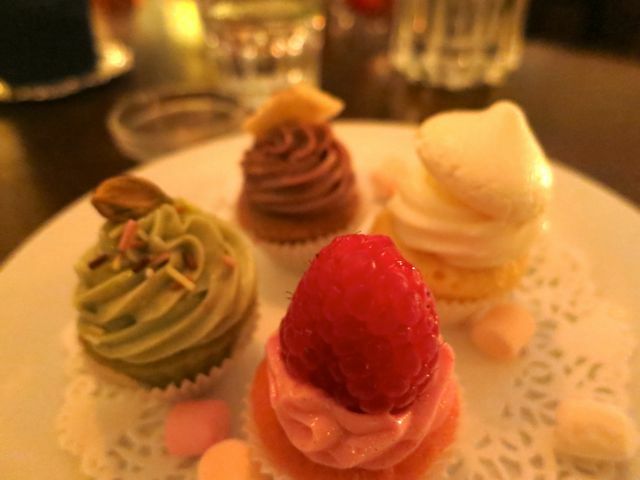 We also tried a quartet of their mini cupcakes. While, I’m not much of a sweet tooth, the frosting was pretty fab. On the food side, the restaurant does burgers and meatballs. For the meatballs you can choose from four different types made in house that you then mix and match with four different sauces. I didn’t try them, so I can’t comment on the taste yet, but sounds kinda fun, no? Considering the crowd that clamored in during my visit, I’d guess I’m not the only one who thinks it seems like a bit of fun. 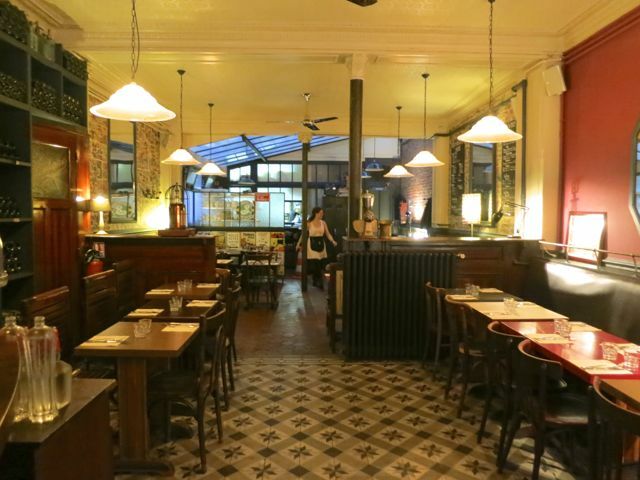 Overall, Café Moderne is a great gateway bar for Bastille: A place turning out better drinks but staying with the relatively low prices to which neighborhood habitués have become accustomed. And, tonight they celebrate their one year anniversary, so I’d say it’s a formula that’s working for them. so, Happy Anniversary, Café Moderne.